Walcut dog crate is an awesome product, no doubt. It is made with heavy duty steel and it comes in three different sizes. It is well-designed and super easy to move it around your home with its attached wheels. But, is it worth buying? This is what we will cover in this review. Not just that. Together we will compare it with a competing product called Proselect Empire Dog Cage. Read on for more..
Now, let’s dive in a little bit more, and take a quick peek at the pros and cons first. Please do not be put off by the cons. As you know, no product is perfect. I wanted to highlight the cons at the beginning of the review, so that you can make the right buying decision. I have friends using it, and they are absolutely happy with it. But, everyone’s need is different. So, as you read the review do ask yourself what your real needs are? Walcut Dog Crate is Foldable! This video will give you a quick overview, there is no voice though. You can use Walcut Dog Crate both indoors as well as outdoors, and that’s the beauty of this heavy duty steel frame dog crate. The wheels make it super easy to move it around, and if you want to take it from indoors to outdoors or vice versa. I know you care for your dog and you’re going, what about stability? Don’t you worry, it has safety locks, which keeps the crate stable and stops it from sliding. If you ever wanted to have an outdoor kennel Walcut Dog Crate is your perfect answer. Because it is strong, affordable and a multi-purpose dog crate. So, with Walcut Dog Crate you are getting more value for your money and certainly more freedom for your dog. Let’s say, when the weather is good, and you want your dog to have some fresh air and sunshine, then just take the crate out and bring it back in, as necessary. The Walcut Heavy Duty Dog Crate is made to perform and to endure. The crate uses high-quality steel for its construction, making it sturdy and gives a robust feel to it. The steel bars are spaced in such a way that your pet won’t feel claustrophobic in the crate. 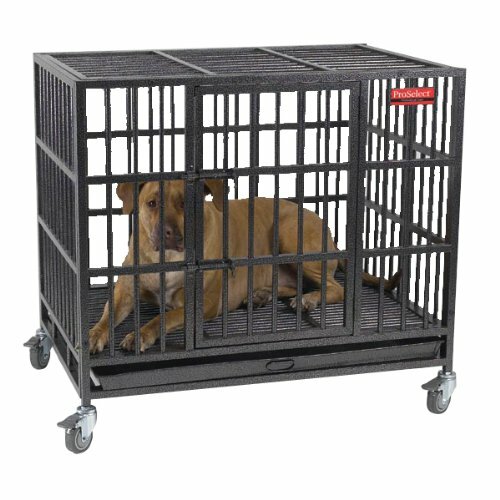 This paves the way for you to easily see your dog even when it is inside the crate. Of course, the appropriate crate size should be according to your dog’s overall size. You can take a look at the sizing chart given below. There are two doors provided in the crate for easy access. The top door is the largest as it is the same size as the top portion of the crate. There is a front door provided in the crate so that you can easily give your dog food and water. The construction is done with usability and portability in mind. Talking about portability, it has four high-quality castors that will help you to move the crate around with very less effort, even if your dog is inside, though I suggest you move it when the crate is empty. Even if Walcut Dog crate looks basic, its jam packed with features. You can see that the crate has two floors. One is grated, and the other one is a solid sheet type. Both can slide out with minimal effort for easy cleaning. With, Walcut dog crate, you will never have to worry about hygiene. As you can see in the picture, the crate is designed in a way that dirt won’t get stuck in unwanted edges or corners. As mentioned above, there are two doors in total for the Walcut Dog Crate. The top door opens upward, and it has a latch to lock it in place. You can secure the front door with two high-quality latches. This setup plays an important role in ease of access as you can use the top door to put a mat or a mattress in the crate when you need to. The front door will enable the entry and exit of your dog. In the above image you can clearly see, one of the bottom floor is grated and the other one is floor type. This will keep the surroundings clean and pristine as no imputes will ever hit the ground. The castors are awesome because they let you move the crate with no effort. They can withstand heavy load and does not fail under pressure. The low friction coefficient ensured, that it wouldn’t get harder or stiff with time. Did you know that this whole dog crate is fold-able? Yes, it is. You can fold the dog crate to no more than a sixth of its height. And the big advantage, you can store the product in its folded form factor, saving big on space. Only very few users have reported their dog bending the bars. To be honest this is a pretty sturdy dog crate by any standards. If a dog is still trying to bend it and escape, then I think it is more a training issue, then a con for Walcut Dog Crate. Also, if you are looking to buy the largest size, there is a bit of flex to it. Anyways, you don’t have to worry about defective products or returns as the purchase will be verified through Amazon. Take care of the wheels because they are not too big, so moving it around in grass lawns or gravel might not be too smooth. If you are looking for a strong and sturdy Dog crate that is well made and portable, then Walcut Dog Crate is a clear winner to all the alternatives. Please do read the reviews in Amazon, especially the “verified” ones and the manufacturer’s instructions before you buy. much different in size too, then it requires some keen looking. And this is where we intend to help you. We will compare Walcut dog crate with its lookalike (almost) Proselect empire dog cage and help you decide which one is a better fit for your home and dog. It will be better if we start off with the similarities between the two so that you are clear about the requirements that both the cages will meet. Material: Both the cages are of heavy duty steel, which means both the cages are sturdy and durable. They will not be easy to break or bend. Hence, they are fit for dogs who are escape artists! Ease of set up: The installation instructions of both the cages are quite clear and you will be able to set up both of them quite easily. In case you face any difficulty then you can get a professional help rather than set it up incorrectly. Design: Well, the designs of the cages are somewhat similar except for a few differences which we will discuss later. Both the cages have a grated design which helps to maintain hygiene. There is steel under tray which helps to clean up food waste or water spills. Both the cages have front doors for easy entry and exit of the dogs. Both have detachable wheels which makes it easy to move the cages around. Now, comes the points that will help you decide which cage to buy. 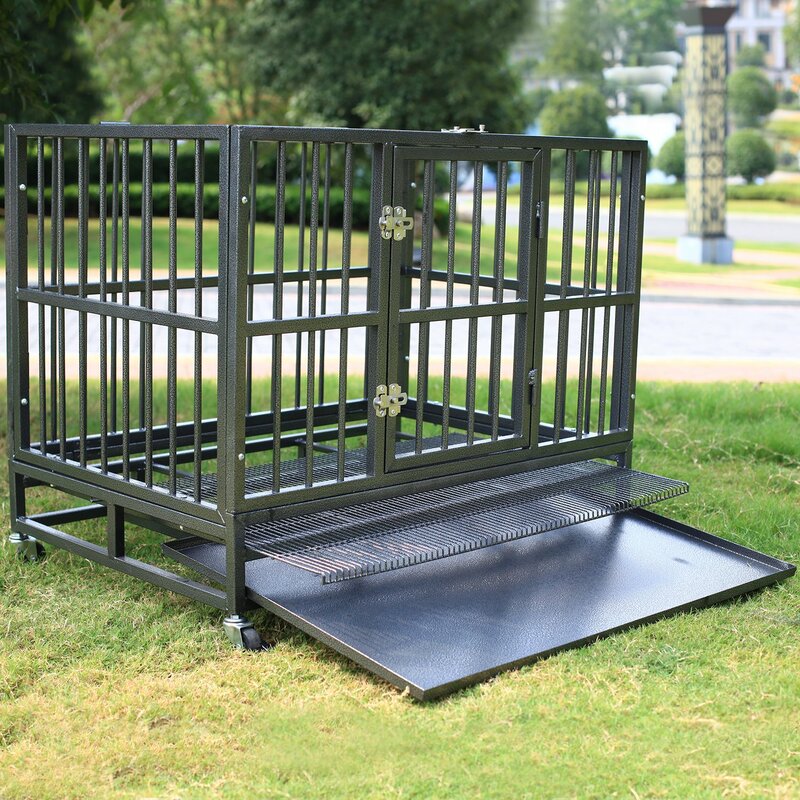 Though mostly it will depend upon your requirements, your dog’s size and weight and of course your budget, it will definitely help to know which one is a better value for money cage. Size and Weight carrying capacity: If you are looking for crates that are big enough to house very large dogs then Walcut crate is definitely the winner here. Not only its size is larger than the Proselect dog cage but its weight carrying capacity is also far better. Walcut crate 48inch has overall dimensions as 48.8” length, 33” width and 37” height. Whereas, the L size Proselect cage has dimensions as 42.25″ length, 30.75” width and 41.25″ height. By just comparing the figures we can guess which one is the larger cage. The Walcut crate is lighter by nearly 15 pounds than its Proselect counterpart. Walcut crate weighs 83 lbs whereas Proselect cage weighs 99 lbs. Hence, carrying the Walcut crate is easier than the Proselect one. Next is the weight carrying capacity. Here again Walcut scores better than Proselect. 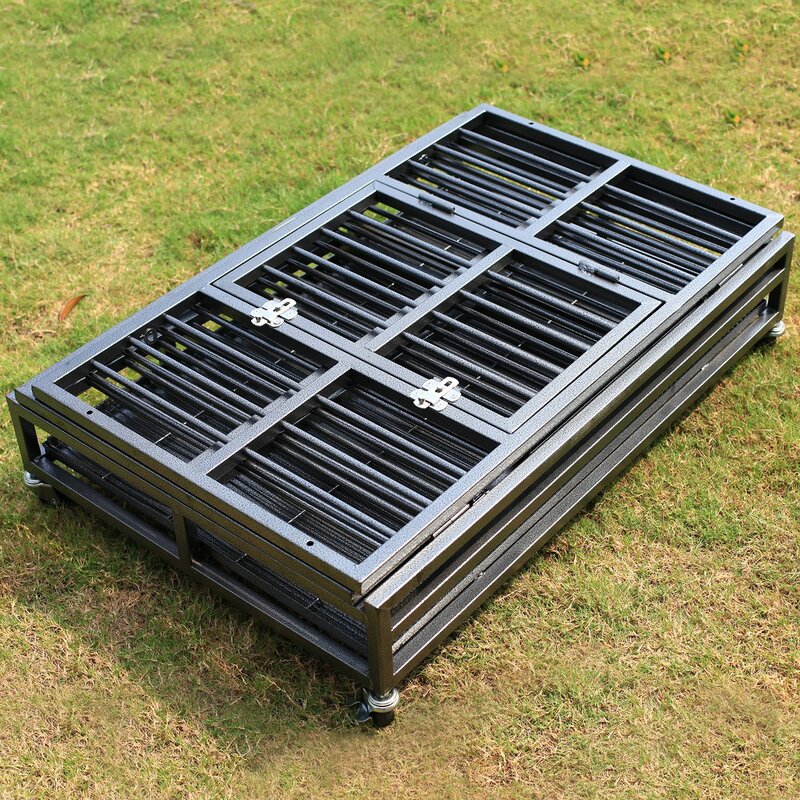 The weight carrying capacity of Walcut crate is specified as 330 lbs by the manufacturers whereas Proselect cage is advertised more as a cage fit for medium or large dogs only. This will mean that the weight carrying capacity of Proselect is 135-150 lbs maximum only. Portability: This is one of the major points of difference which might tilt your opinion towards one particular cage. If you want to take the cage along with you while travelling then Walcut cage only fits the bill. You can easily fold it and carry it along with you. On the other hand, Proselect cage is not fold-able. After setting it up you will be able to use it in a limited space only. Though you can move it from indoors to outdoors or vice versa because of its wheels, you cannot take it while travelling. Design: The major difference in the design between the cages is the extra top door in the Walcut dog crate. This makes it very easy for the owner to place a mat or a blanket in the crate. This facility is also useful if you have trouble giving food to your dog from the front door. Some dogs are over exited and might escape when you open the front door to give them food. In order to avoid this situation you can use the top door to offer food and the front door for letting the dog out. This facility is not there in the Proselect dog cage. Cost: The Walcut cage is definitely a more economical option than the Proselect cage. The Walcut cage is a strong cage to keep your medium to extra-large size dogs secure inside its four walls. It is definitely value for money and a much economical option than the Proselect cage. 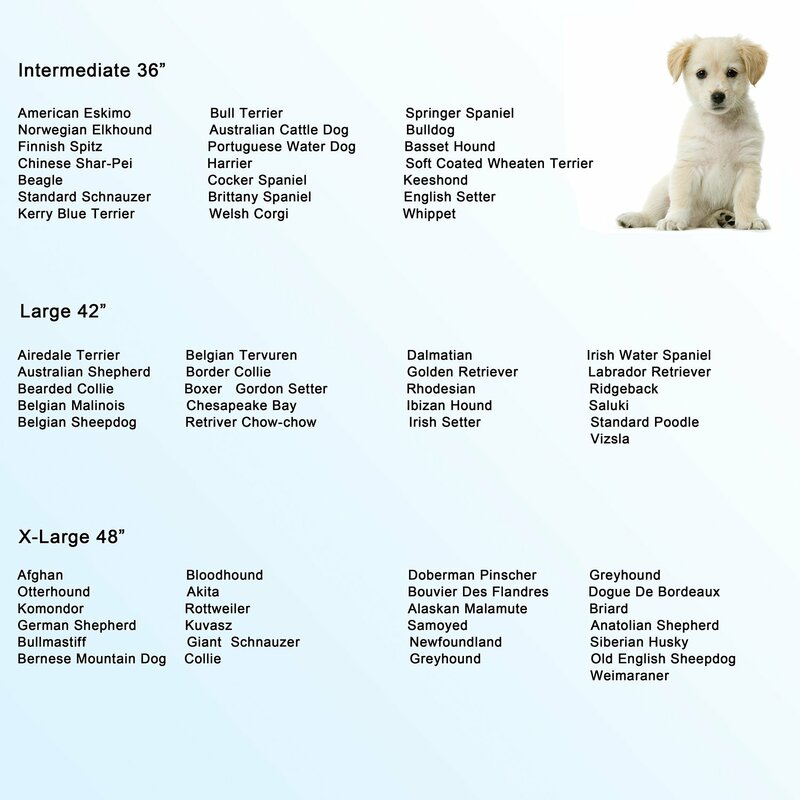 (1) Dog Size Chart – various breeds. (2) More Dog Crates – read this article to find out our other dog crate reviews.